Matthew Francis Starry, 79, of West Miner Street, Coaldale, formerly of Fairless Hills, died Friday, November 07, 2014, in his home. He was the husband of Elaine "Betty" (Krapf) Starry. They had been married for 55 years. Born November. 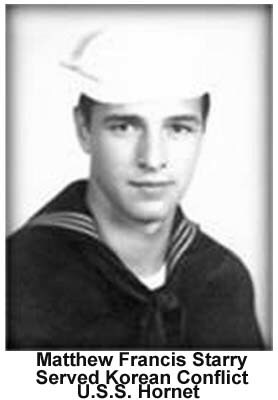 09, 1934, in Coaldale, he was a son of the late Matthew and Kristina (Prachar) Starry.A veteran of the U.S. Navy, he served aboard the U.S.S. Hornet (CV-2) during the Korean Conflict. A 1951 graduate of the former Coaldale High School, he was a member of the West Penn Archery Club. Surviving, in addition to his wife, are two daughters, Leslie McDonald of Jim Thorpe and Kristina Starry of Lansford; two granddaughters, Alyssa Benek of Bowmanstown and her companion, Richard Sokoloff, and Alexis McDonald of Coaldale; grandsons, Matthew Dale and Joseph Dale, both of Lansford; two great grandchildren, Andon Macaluso of Bowmanstown and Logan Benner of Coaldale; two brothers, Edward of Fairless Hills and Thomas and his wife, Ann, of Tamaqua; a sister, Eleanor, wife of Julius Inglima of Apple Valley, Cal. ; many nieces and nephews. He was also preceded in death by a grandson, Christopher Dale; three sisters, Margaret Rapant, Mary Collins and Rose Mary Starry. Service: Memorial Mass, 10 a.m., Thursday, November 13, 2014, St. Joseph's Catholic Church, 462 W. Ludlow St., Summit Hill. Interment, with military honors, SS. Cyril and Methodius Cemetery, Nesquehoning. Call 9-10 a.m., Wednesday, at the church. Arrangements by the Gulla Funeral Home, 130 E. Ridge St., Coaldale. Memorials in his name may be made to St. Luke's Hospice, c/o Development Office, 801 Ostrum St., Bethlehem, PA 18015. Online condolences at www.zrgfuneralhomes.com.